Tony Smith’s “Cigarette”—on view on the Elmwood Avenue side of the Albright-Knox Art Gallery—is a perfect example of the artist's trademark monumental minimalist sculptures. Smith created abstract geometric constructions that utilize simple forms to create strikingly complex compositions. The three-dimensionality of his works make them interesting to view from many different angles. The title and shape of this large outdoor steel work were inspired by the appearance of a cigarette that had been lightly puffed and ground out in an ashtray. Love is a pop art image by American artist Robert Indiana. It consists of the letters L and O over the letters V and E in bold Diodone type. The O is slanted sideways so that its negative space creates a line leading to the V. The original image, with green and blue spaces backing red lettering, served as a print image for a Museum of Modern Art Christmas card in 1964. In much this same form the design soon graced a popular US postage stamp. Despite its huge size and its use of what some might consider unorthodox media (60-plus silver canoes), the sculpture is pure formality. It is not about boats, water, or salvage. There is no environmental message. It is a beautiful explosion of vaguely organic forms, alive with dynamic tension. Like some of the other abstract works outside of the museum, it transforms its raw materials and challenges the viewer to see the extraordinary within the ordinary. Karma, 2010, a twenty-three-foot-high, monumental bronze sculpture, appears at first to be a graceful curvature, rising up in a trajectory that defies normal structural integrity. Closer inspection of the work reveals that is it composed of a striding human figure that carries on his shoulders a series of crouching figures, perched one on top the other. Each figure holds his hands over the eyes of the figure beneath him, as if to show that humanity's reliance on its fellow man is not only essential—we all stand on the shoulders of those who came before us—but a complete and terrifying leap of faith. This leap of faith is especially evident in the dangerous degree to which this chain of humanity is stretching into a gravity-defying arch. Liam Gillick’s “Stacked Revision Structure” is a twelve-foot cube fabricated from powder-coated aluminum that was created specifically for the Albright-Knox Art Gallery. A minimalist sculptor, Gillick strives to create a conversation with the architecture that surrounds his artworks. 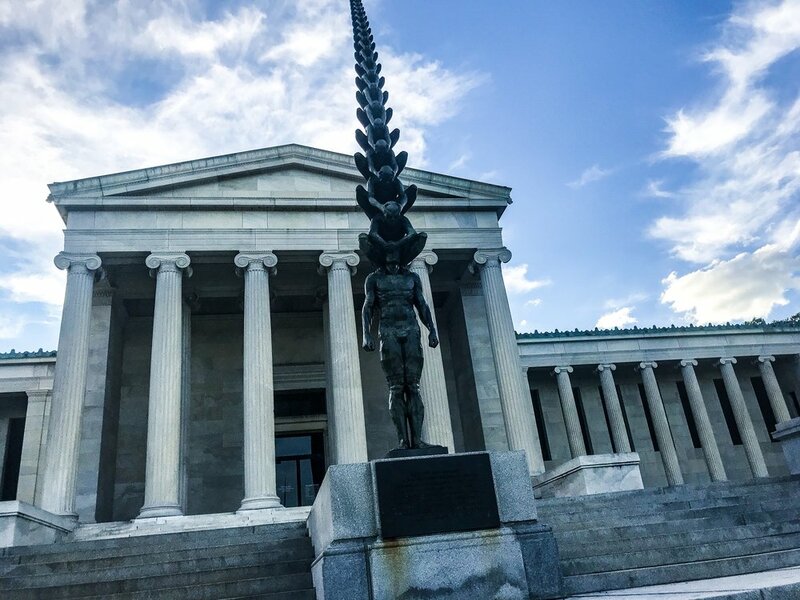 This sculpture is positioned in such a way that you can view either the classical architecture of the museum's 1905 Building or the modern architecture of its 1962 Building as a backdrop. John J. Albright commissioned Augustus Saint-Gaudens to create the eight marble figures featured on the Albright-Knox Art Gallery’s North and South Porches to complement the architectural design of the museum’s original building, which opened in 1905. While Saint-Gaudens completed the sculptures between 1906 and 1907, they weren’t permanently installed until 1934. The figures are modeled on those of the Erechtheum in Athens, and symbolize victory and the arts of painting, music, sculpture, and architecture.